To register, click on PDF button below. Download PDF file and fill out. You need Adobe Acrobat to open this file. This is a weekend event, NOT a one day field trip. Deadline for registration is November 28, a registration form is enclosed. Please mail so your form and payment are received by that date. This year we will return to Camp Hardtner, an Episcopal Church Camp near Alexandria, LA. The nearest airport is in Alexandria LA (AEX), 20 - 25 miles distance. Most major airlines and rental cars have services there. Our Chief Mycologist is Walter Sturgeon of Ohio, a nationally known mushroom expert, author, and photographer. Walt is very active with the Ohio Mushroom Society and with NAMA, who gave him it’s Award for Amateur Mycology. 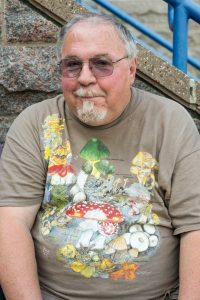 He will present on Saturday evening “Just for the Smell of it - A whimsical look at mushrooms and their fragrances”. We do not have a student to host or present at this time, but who knows who may turn up by December? We will arrive on Friday Dec. 7. There is no set check-in time. We plan to have the registration table set up in Henton Hall by 3 PM. Henton Hall is near the Holy Day Inn. All activities will be in Henton Hall, except meals, which will be in the Dining Hall. There is a kitchen in Henton Hall, with a sink, range, refrigerator, and microwave, for persons who bring perishable items or their own food. We may also use it for cooking mushrooms if needed. There are no utensils, so bring your own pots, pans, etc. if you plan to prepare food. Lodging will be in the Holy Day Inn on the west side of the main road. There are only 21 rooms; most have been remodeled: with 1 queen, a double plus a twin, or two twin beds, chest, desk, and night table. There are no telephones or TVs. If you prefer, you may push the twin beds together. All linens and towels are provided. When these rooms are filled, registration will be closed. A rooming list will be in Henton Hall. Room keys are NOT provided. If you require a key, you may obtain one at the Camp office, in the Dining Hall, for a $50 CASH deposit, (no checks), refunded upon checkout on Sunday and turning in the key. Ask Patricia at registration for info on Wi-Fi available in the dining room, hallway, Henton Hall, and Holy Day Inn. See the registration form for the times that the meals will be served in the Dining Hall, or below. The food line will be set up, served for 30-40 minutes, and closed. So please be sure to be on time for meals. If you require vegetarian meals, you may pay for meals and serve yourself from the buffet/salad bar or do not pay for food, bring your own food and drinks and prepare it in the kitchen in Henton Hall. We will have self-serve chicken and sausage gumbo with rice and potato salad for dinner on Friday beginning at 6PM, in our meeting rooms, with a social afterward. After breakfast on Saturday at 8AM, we will depart at 9:30 from the parking lot to foray either on the Camp’s 160 acres or in the Kisatchie National Forest nearby (we have applied for permits). Lunch will be served at 12 noon. Dinner will be served at 6PM. Afterward, we will return to Henton Hall for presentations, followed by a social. Sunday morning breakfast will be served at 8, the walk-around-the tables will be held at 9:30. After clean-up we can all be on our way, at our leisure. Direction to the Camp follow: If coming from the north on Hwy 165, DO NOT turn left @ the first “Camp Hardtner” sign you see @ the junction with LA 123 (the road is bad). Go 3.3 miles further and turn left @ the junction with LA 524. From the south and Pollock, turn right at the first “Camp Hardtner” sign@ LA 524, go 4/10 mile to “Hunt Forest Products” and turn left, continue on and bear left at a Y. The route is well marked with “Camp Hardtner” signs. From Hwy 165 to the Camp is approximately 3 miles. As you enter the camp, notice the Chapel, large Dining Hall, and Hargrove House on the right. Across from Hargrove House, go left to enter the parking lot between the manager’s residence, and the Henton Hall and Holy Day Inn. Come to Henton Hall for registration and information.